Howard Munce, the well-known painter, illustrator, sculptor and writer, a figurehead of Westport’s creative community since the 1930’s, died in his home on Saturday, March 5. He was 100. His death was confirmed by his daughter, Mary Brewster, who said that he was recently placed into hospice care, but was otherwise comfortable and in good health. Mr. Munce possessed a unique wit and creative style that was not swayed by the fashions of the decades, but rather inspired by the moments those years afforded him. He began his creative career in Westport in the late 1930s as an independent artist and writer, later attending Pratt Institute and graduating in 1938. These formative years saw Mr. Munce experiment with illustration, painting and sculpture. Each work showcasing the mix of imagination, humanity and frank humor that would later become his hallmark. It was Mr. Munce’s time as a Marine and Second Lieutenant in the Pacific Theater of World War II that inspired his most public distinction. Harrowed by the horrors of combat, he penned an anti-war poem and cartoon that was nominated for a Pulitzer Prize in 1946. After the war, Mr. Munce worked as a creative director for notable New York advertising agencies like Young & Rubicam, J Walter Thompson, and Foote Cone and Belding. As an ad man, he led national accounts for Rheingold Beer, Jaguar and others with a keen eye, sense of humor and self integrity. Disillusioned with the trials of the ad world, Mr. Munce moved back to Westport and set out on his own as an illustrator, writer and teacher. It was this choice that led to some of the most creatively fertile years in his prolific career. In Westport, Mr. Munce worked with, befriended or taught generations of creative residents. He could regularly be found attending sketch classes, curating shows and present at art openings into his nineties. The feel of the piece, Mr. Munce would often say to those he taught or mentored, is most important. Forget about straight lines, misspelled words or lumpy welds, those things are not the point—the emotion trumps all that technique. His personal work was rooted in this philosophy, simple notions that inspired countless burgeoning artists in the Westport community and beyond. Howard Munce is survived by his daughter Mary Brewster, his son Andrew Munce, their spouses, their children and their children’s children. As well as his sister-in-law Agnes Conover and the descendants of his late wife, Geraldine Conover. 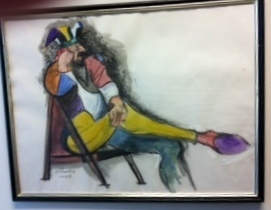 Munce, Howard, “Pooped Jester,” Westport Public Schools Digital Collections, accessed April 24, 2019, https://collections.westportps.org/items/show/1582.